I confess I’m a picky eater when it comes to sweets. Unlike my husband, I don’t think that if something contains enough sugar or HFCS, it’s automatically tasty. That’s why I could never imagine myself signing up for any subscription that would not let me chose the products I want. But when I stumbled upon some services that bring authentic Japanese food right from Japan and to my doorstep, I couldn’t walk away without trying them. I also told myself that even if I didn’t like them, it would be a part of my research of Japan for my current novel. After all, you never know what will come in handy. So far, I’m not disappointed. Snakku is a subscription service that will send you almost two pounds of sweets and snacks in their Signature Box every month. For those who just want to try, they also have a smaller Tasting Box for a lesser price. Or you can buy some separate sweets in their shop. As with many things in Japan, the outward appearance is as important as the content. You can see this in the photo below: the packaging is beautiful. From the box itself to the candy, cookies, and snacks—they do seem to be hand-picked, both for quality and for aesthetic reasons. I highly recommend Snakku to anyone who is not on a sugar-free diet. 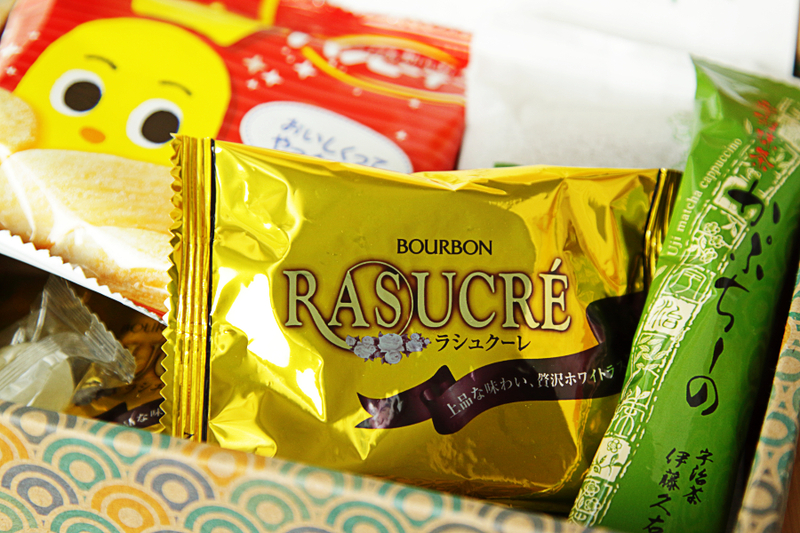 Sugoi Crate will give you the most variety of snacks and even include a bottle or a can of a drink: soda, juice, or tea. Doki Doki: an assortment of kawaii (cute) things. I can’t tell more because I’m not subscribed (though I might try it out of curiosity). But you can check the previous crates on their site. Kira Kira: various beauty products. Japan is famous for its quality cosmetics, especially for those made for the inner market. 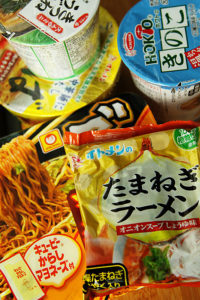 Umai Crate: a box of instant noodles (soba, ramen, etc). Gacha Gacha: small toys from vending machines. The quality of the food items is not as high as in Snakku boxes. By this I mean that you can easily see yourself giving almost anything from a Snakku box as a birthday present to an adult. The stuff in Japan Crates is rather of a junk-food style you can imagine yourself grabbing from a Walmart shelf. Japan Crate boxes are cheaper: $25-35 in comparison to $40 for the Snakku Signature box. I think that these two services show two sides of Japan (of which there are many). One is of Japan as a mecca for a foodie, a country of premium-quality food with notorious devotion to pleasing customers and attention to freshness, seasonality, and beauty. The other is of lower-brow, common-folk stuff, which also seems to have the same devotion: a common Japanese conbini (convenience store) is stocked with fresh (restocked up to several times a day) prepackaged food—sandwiches, onigiri, and bento boxes with seasonal ingredients. It doesn’t mean that all Japanese food is healthy. Deep-fried food is common, and some regional delicatessens like kakuni (braised pork belly) can kill you just by thinking about their calories. But freshness, seasonality, and small portions make even the ‘junkier’ part of Japanese cuisine better than food in general in some other countries (let’s not point fingers). Another thing that I noticed is how creative some of the snacks are. Sure, a lot of premium sweets are simple and probably take pride in being simply delicious, made only with several natural ingredients. But if you want to see a cookie ornated with a real dried shrimp, strawberry-flavored potato chips, or sandwich with noodles (yakisoba pan)—that’s Japanese food too.